After building an attenuator, the attenuation can be easily and accurately measured with a DC voltage. Voltages can measured accurately with a digital voltmeter. To get the wanted attenuation, the attenuator must always be terminated with a 50 ohms. 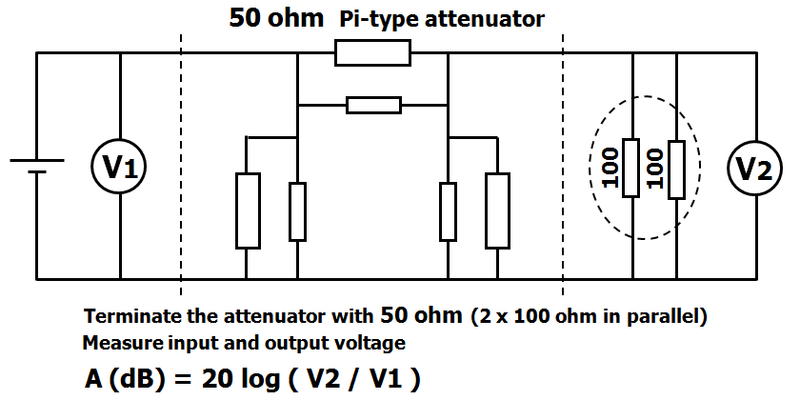 During the measurement, the attenuator must be terminated with an 50 ohm resistor, that is connected to the output. Two resistors of 100 ohm in parallel form an accurate 50 ohm resistor. After the measurement, this 50 ohm resistor, must be removed. An attenuator built with resistors of 1/4 watt, can dissipate slightly more 250 mW. Apply a voltage to the input. Measure the voltage at the input (V1) with the digital voltmeter. V1 is adjusted to to 3.2 V.
These values were measured at a 10 dB attenuator.